Richard J. McIlvery, professor, is the founder of the Music Industry program. He has been a professional guitarist and studio musician since 1963 and a recording engineer since the early 1970s. As a musician he toured with Waylon Jennings, performed or engineered on soundtracks of Why Do Fools Fall In Love, Nothing But Trouble, Howard the Duck, Things Are Tough All Over, Action Jackson, Ace Ventura: Pet Detective, What’s Love Got To Do With It and Inventing the Abbotts, and appeared on over 100 albums and singles. 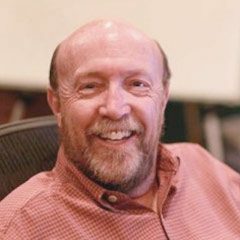 As an engineer his credits include over 200 albums and singles, numerous films and TV shows such as The Shadow, Ace Ventura: Pet Detective, Birdland, Dr. Quinn: Medicine Woman, Civil War Journals and Beverly Hills, 90210, as well as commercials for radio and television. He has worked with Mark Isham, Michael Kamen, Patrick O’Hearn, Danny Elfman, Tom Scott, Dan Foliart and Thomas Dolby. He composed the orchestral score for Spaceflight, as well as several other nationwide PBS documentaries and specials. McIlvery is a life member of the GRAMMY Foundation, is co-chair of the GRAMMY Foundation’s Producers and Engineers Wing Educational committee, is a member of the Audio Engineering Society Education Committee, the Guild of Music Supervisors, the Music Entertainment Industry Educators Association and the Advisory Council of the Mr. Holland’s Opus Foundation. He was also on the board of directors for the Music Producers’ Guild of the Americas and is a continuing panel member of the Mix Magazine TEC Awards Nominating Committee. He has lectured on recording, music business and film scoring technologies at the Sibelius Academy, Helsinki, Finland; the Audio Engineering Society sections in the Netherlands and Switzerland; Shobi Music Business College in Tokyo; and at the City University of Hong Kong. Film and Television Credits: Nothing But Trouble, Things Are Tough All Over, Last Of The Mohicans, Ace Ventura; Pet Detective, Howard The Duck, Action Jackson, What’s Love Got To Do With It?, Why Do Fools Fall In Love?, Romeo is Bleeding, Cool World, Hardball, Inventing The Abbots, Home For The Holidays, Short Cuts, Last Action Hero, The Mask, Rosanne, Home Improvement, Seventh Heaven.